Whilst the sun might look relatively benign from here on Earth, in reality it’s a hugely powerful star which undergoes many storms, some of which scientists are only just beginning to understand. Scientists can now predict the likelihood of coronal mass ejections, or CMEs with relative ease because these events are usually preceded by some kind of warning sign. 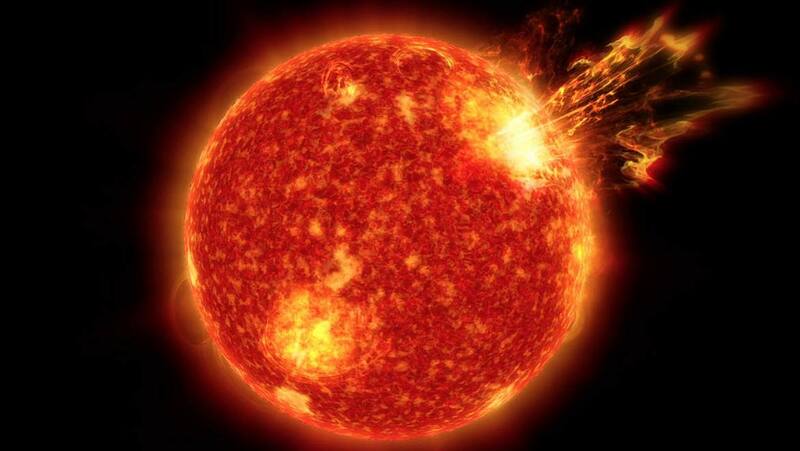 This can include the presence of more energetic particles, bright flashes or bursts of heat. CMEs can lead to solar flares, which if they occur when the affected area of the sun is pointing towards the Earth, have the potential to inflict serious damage. More mysterious altogether are the so called stealth CMEs. These are so called because they appear without any apparent warning. Now, a team of scientists, partly funded by NASA and led by the Space Sciences Laboratory at the University of Berkeley in California, has simulated the process by which the stealth CMEs actually form. The team build a computer model, using data from NASAs STEREO spacecraft and the European Space Agency Solar and Heliospheric Observatory (SOHO). The data within the model was refined until its output matched the real-life observations collected by the NASA missions. What they discovered was that the stealth CMEs move at a far slower rate than a standard CME. Whilst a typical Coronal Mass Ejection moves at up to 1800 miles per second, stealth CMEs travel at the considerably slower rate of 250 – 435 miles per second. At this speed, they are much less likely to be responsible for major weather events within space but crucially, they are still powerful enough to cause disturbances within the Earth’s magnetic field. And it was the sun’s magnetic field that was the focus of the model developed during this research. The team found that a process called differential rotation was primarily responsible for the development of these stealth CMEs. Differential rotation in basic terms, describes the fact that different areas on the surface of the sun rotate at different speeds. For example, the sun rotates much slower at the poles than it does at its equator. This causes the magnetic field to spread at different rates, which is the underlying cause of the stealth CMEs. All research that tells us more about the ways in which the sun affects space weather is valuable, and the development of a model which can improve our ability to predict the occurrence of these stealth CMEs is bound to help refine forecasting systems for our closest star.